This summer I’m flying through products like its nobodies business. There’s just something about the warmer weather that really makes me want to spend time getting ready and taking care of myself. I guess I just get a new lease of life when the sun is shining. 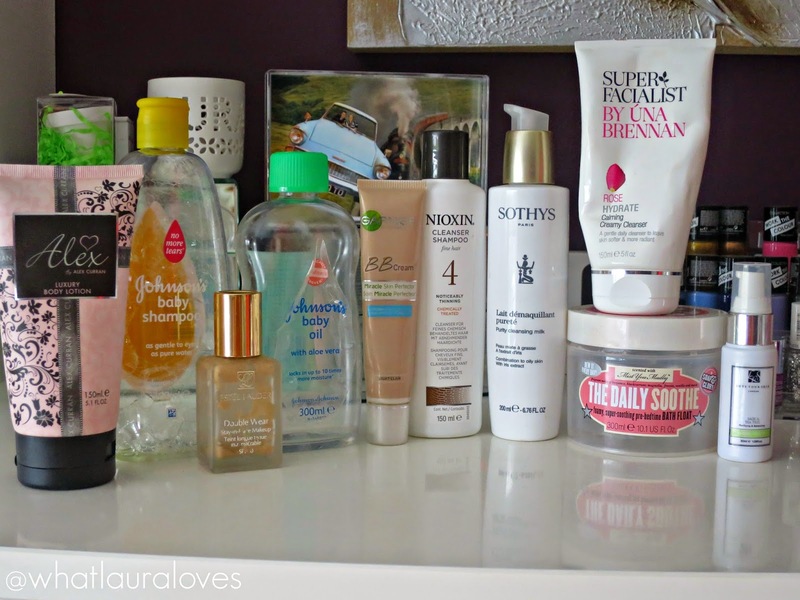 I’ve got lots of empties to share with you as I’ve been using up lots and lots of products recently. Last year I ran out of my MAC brush cleaner and didn’t want to replace it as I thought it wasn’t really worth the money, so I reverted back to an old favourite to wash my brushes with- Johnsons Baby Shampoo. Whether you’re using this as a shampoo for your head (great if you suffer from scalp problems or have psoriasis) or to clean your make up brushes, it is super gentle. I’ve heard many people say to not use shampoo to clean your make up brushes with as it can dissolve the glue in the ferrule, causing the bristles to shred. So whilst I wouldn’t recommend the use of shampoo to clean your brushes with, in case this happens as I don’t want you to blame me, what I will say is that I’ve been using Johnsons Baby Shampoo to clean my make up brushes since I was 16 and I still use the same brushes almost ten years later so it can’t have done mine much harm. I’m going to try out some other brush cleaners would but I would definitely repurchase this Johnsons Baby Shampoo for when I’m giving my brushes a deep clean. It’s really affordable at £2.20 for 300ml and lasts a long time, depending on the number of brushes you have. 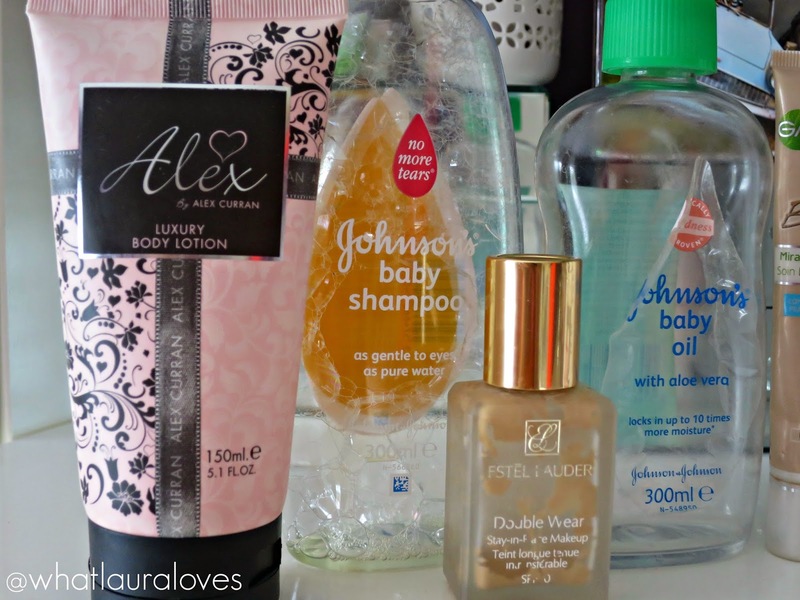 I’ve been using Johnsons Baby Oil in my bath for years and if you’ve been reading my blog for a long time then you might remember my post where I talked about the different ways that I use it. That post is linked above but in short, I use it for a few different purposes- in my bath as a lazy way to moisturise my skin, in the bath or the shower with my exfoliating gloves to break down and remove the last traces of false tan and I specifically use the formula with aloe vera in my bath and directly onto my skin if I ever have a little sunburn as it helps to replenish moisture and reduce redness. I have some other bath oils to finish using but when they have ran out, I’ll definitely repurchase this Johnsons one as it is so cheap (£2.61) and very effective. Estee Lauder Double Wear is a foundation that I have been using for YEARS, literally since the start of writing of my blog. I use the shade 2W1 Sand 36 and tend to reserve this foundation for evenings out as it is quite heavy. It has a full coverage formula that lasts all day, although I do find that it oxidises towards the end of the day so I tend to use it on nights out where I need my make up to look flawless for a good six hours or so. I have another bottle of this that I’m about half way through but when I’ve finished it, I will be buying another bottle. This is probably my favourite base product from the drugstore. In fact no, it IS my favourite base product from the drugstore. This BB Cream is the one that is for combination to oily skin and if you have read my blog in the past, you’ll know that my skin is ridiculously oily. This is the only drugstore base that I have found to be very lightweight, yet have a decent amount of coverage AND keep my oily skin at bay throughout the day. This is the light shade which I have just ran out of but I also have a bottle of the medium shade in my stash for when I go on holiday and have a deep, dark tan. I would absolutely recommend this BB Cream as it is the best that I have tried and I’ll definitely be repurchasing it. 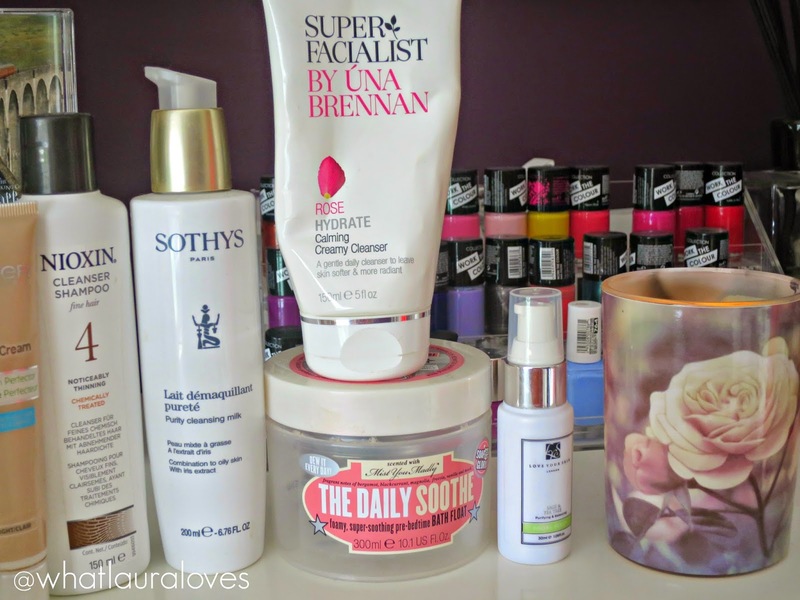 The Sothys Purity Cleansing Milk for combination to oily skin with iris extract is THE BEST cleanser I’ve used in a long time. When I use it in the morning, it makes my skin feel fresh and clean, having cleansed my skin of any excess oils. When I use it at night, it effectively melts away the make up from my face and leaves my skin clean, soft but not dehydrated and stripped. I’ve already bought another two bottles of this… oops, sorry bank balance! Oh I had such high hopes for this product but it was, well, a little pointless. The Daily Soothe Bath Float is designed to be a super soothing, foamy product to use in your bath before you go to bed. It is scented with Mist You Madly which is another Soap and Glory body spray kind of product but I didnt find the scent to be strong enough. It has passion flower slumber juice, softening phytofleur cactus extract and a tahitian gardenia petal infusion listed within its ingredients which I’m assuming are supposed to soften the skin and help you to relax but if I’m honest I didn’t feel any more relaxed than I would normally do during or after a bath. I wasn’t expecting this product to create loads of bubbles but I did think that it would bubble up a little bit but it was very pittyful. I’ll not be repurchasing this. The Love Your Skin Sage and Tea Tree Purifying and Balancing Facial Serum is great for any skin type that has greasy or shiny areas with blocked pores or blemishes. It suits my skin perfectly and really helped to make my skin feel balanced as part of my morning and evening skincare routine. This is a very lightweight product so it doesn’t overload or clog the skin. I have lots of serums to use up so I wont be repurchasing this one just yet. I spoke about the Nioxin conditioner in my last empties post and this is the shampoo. Great to actually thicken the hair and to help it to grow by strengthening it. I will absolutely be repurchasing this. You can read my review of this body lotion that I received in a gift set on the link above. Fragrance is very powerful in evoking memories for me and this perfume reminds me of someone I’d like to forget so I’ll not be repurchasing it, although it is a nice smelling, light lotion. The Superfacialist Rose Hydrate Calming Creamy Cleanser is a great option for dry skin types. Its a little too heavy for my skin to use morning and night so I wont be repurchasing it but it is definitely something I would recommend to those with dry skin. What products have you used up recently? 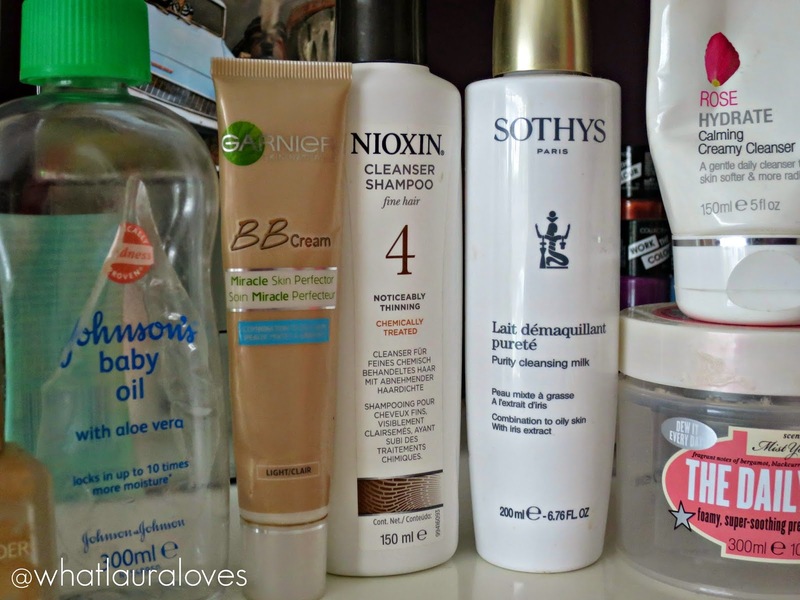 Do you find that you use up more products during the summer or winter months?